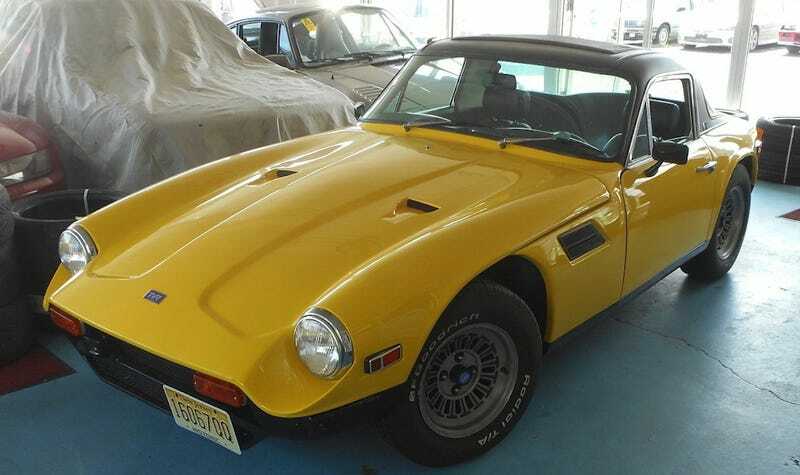 For $19,995, Would This Restored and BMW-ified 1974 TVR 2500M Make The Grade? Once upon a time today’s Nice Price or Crack Pipe TVR 2500M came with a Triumph motor under its tippy-forward hood. Now it rocks a BMW M50 and you’ll have to decide if that and its price make it a triumph of another order. Diamond Star Motors may have been located in Normal Illinois, but for 75-percent of you, paying the substantial asking on yesterday’s DSM-originated 1990 Eagle Talon TSi wasn’t going to become the new normal. That was the vote that sank it in a Crack Pipe loss, and that was despite all the comments noting how bananas a fan of DSM cars would go over so clean a machine. I think we all can agree that we don’t see old those Talons, or their sibling Lasers and Eclipse models in all that nice of shape any more. You know what you see even fewer of these days? That’s right BMW-powered TVR 2500s. They’re like hen’s teeth, leprechauns, or politicians not on the take—you just never seem them at all… oh wait, there’s one right now. The seller of this 1974 TVR 2500M with its BMW M50 says that his dad has worked on the car since it was new, and bought it off its first owner six years ago. Since then it’s claimed that he did a full frame-off restoration of the car, rust-proofing the backbone frame with a bath of POR15 while freshening the bodywork above. It was at that time apparently that he decided to chuck the old Triumph 2.5-litre six from which the car derived its name and install the BMW mill. That comes with the same cylinder count as the TR6 motor, but little else in common. Should they be aired up as college roommates I predict awkward times for both. That Bimmer six is backed up, according to the ad, by a Getrag five-speed and the install looks to be pretty tidy. The M50—year of manufacture and displacement goes undisclosed—does take up more room at the aft-end of the engine bay than did the Triumph mill, apparently limiting space for the long snake of dryer vent hose that typically runs from the nose of the car to the heater plenum behind the curb-side wheel. Peering under the hood you might also take note that the spare up in there isn’t going to do you much good in the case of a flat. I love the M-series TVRs and should point out that the pictures here don’t really do justice to just how freaking small a car these really are. The door openings are tiny and if you’re taller than the average bear you’re going to have a hard time fitting inside no matter how much Astroglide you apply. Fortunately this one comes with a Britax sunroof punched through its vinyl-clad roof. That roof is a lovely detail, as are the factory alloys, of which we noted under the hood this car has five. The interior looks to be in decent shape, although the plank on the dashboard—literally I mean, I think that’s a hunk of plywood—is wrong. It should be a vinyl-covered unit with a hole on the passenger side for storing your knuckle-less driving gloves. Also, the steering wheel center cap would be a nice addition. I think the car itself would be a nice addition to any real enthusiast’s garage (hint, hint wealthy benefactor.) Is it a museum-quality example of the marque? Oh hell no. But seeing as TVR used a panoply of other people’s engines over the course of the M-series’ life, I don’t see the BMW mill as sacrilege, and it’s got to be a hoot and a half to drive with it in there. Still, what would all that be worth? The asking price is a cool $19,995 a price that would buy you two tidy modest-mileage Porsche Boxsters, or one not so old Scion FR-S. None of those cars would be as cucumber cool as this TVR, however. What do you think, is this Bimmer-fied M-series worth that kind of cash? Or, does TVR in this case stand for Too Very Rich for your blood? Southampton Imported Cars out of Southampton NJ, or go here if the ad disappears. H/T to HoneyBunchesofGoats for the hookup! For $11,500 Would You Sink Your Claws Into This Super Clean 1990 Eagle Talon TSi? For $5,750, No It’s Not A Triumph!